Because of this, December is a time when I focus more on how I eat and less on what I eat and, in my health coaching practice, I encourage my clients to do the same. Along the way, while focusing more on the how we eat, we become more mindful of the what we eat because our bodies actually know what is best for us, often all we need to do is listen. 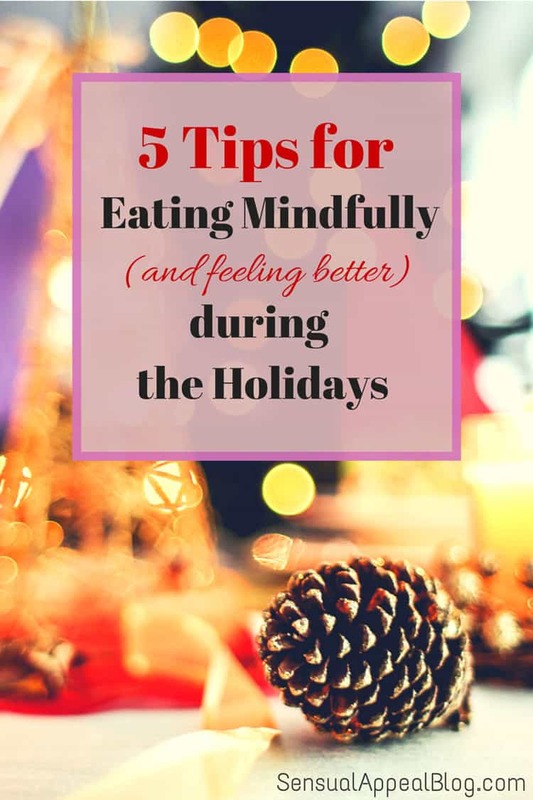 Here are my top five mindful eating tips for the holidays. Chew Chew each bite of food 20 or even 30 times. You will notice and appreciate it so much more, you will eat more slowly and, perhaps enjoy the company of those around you more. It’s also good for your digestion. Eat Chocolate. Try the following exercise. Choose a piece of chocolate (ideally dark chocolate). Engage all five of your senses as you experience it. As you unwrap feel the wrapper and the sensation of the chocolate in your hand, hear the sound of it being unwrapped, smell the delicious aroma, observe what it looks like, and then place it in your mouth and taste it. Then let it linger in your tongue. Do not bite or chew it, but let it slowly melt in your mouth as you pay close attention to its taste, smell and feel. If you want to do a comparison test, notice the difference between doing this with high quality dark chocolate and an inexpensive piece of candy – the latter tastes a little bit like plastic I think and the dark chocolate is better for you. Use small plates. If you are at a party and feel overwhelmed by all of the choices at a buffet or food table, choose a smaller plate. Then choose two or three items that look appealing and enjoy them as you enjoy the gathering. Then, go back for more if you want. The food will taste better, you will be less likely to overeat, and you will make wiser food choices. Along the same lines, if you are concerned about over imbibing, try alternating between a drink with alcohol and a glass of water. Sometimes I will put water in a martini glass and slowly sip at it, feeling very sophisticated in the process. You will not only feel better at the end of the night, but you will get home safely and feel much better in the morning! Eliminate distractions while you eat. This applies at home, at work, out in the world and whether you are alone or with many other people. If you are at work, always step away from the computer and even your desk when you eat lunch (or breakfast or dinner). You need the break, you deserve to enjoy your food, and you will actually be more productive when you return. Ideally, even go outside and get some fresh air either to eat or after your finish. At home, eat with your loved ones at a table, without TV, smartphone, or video games. Actually engage in conversation. If you live alone, set a place setting and enjoy your food without reading, writing or external distractions. And, don’t eat in your car especially when you are driving, not only is it bad for your health, it’s dangerous. You don’t need to do all of these things this holiday season, but I do challenge you to try one or two of them. See how it makes you feel, see if it leads to healthier food choices and, even more importantly, if it provides you with greater enjoyment not only of your food but of your life. 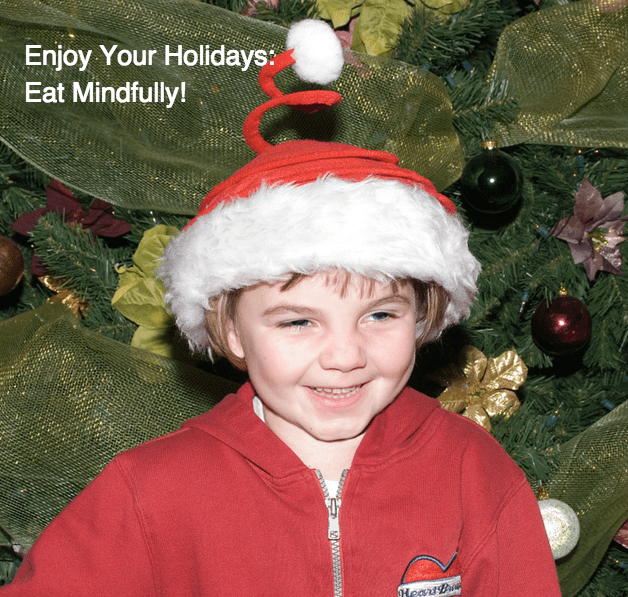 And, if mindfulness while eating appeals to you, continue expanding it to other areas of your life.